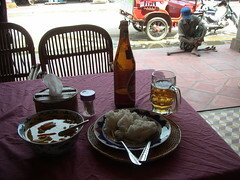 This was my first meal after arriving in Siem Reap. Tasty chicken curry Cambodian style. There was a Taiwanese couple at the next table that shared their pumpkin soup with me. Mmmm. The guy in front of the restaurant was one of the many, many landmine victims I saw. This is still a terrible problem and doesn't show any signs of abating anytime soon. In many ways this picture sums up what I experienced in Cambodia: A fantastic culture, generous hospitality, extreme poverty, and great personal tragedy.